"If we could alleviate some of their uncertainties about how they would live once they or their spouses are no longer working, they might be more prepared to consider others," he added. For example, Singapore could do "a lot more" in social risk pooling, he said, citing CPF Life and MediShield Life as examples of Government-led risk pooling schemes. Communities could come together to create their own programmes, Mr Gee added. "Some risks can be pooled on a community basis with little intervention from the Government, but they need to trust each other and have a willingness to share risks in return for a shared future together." 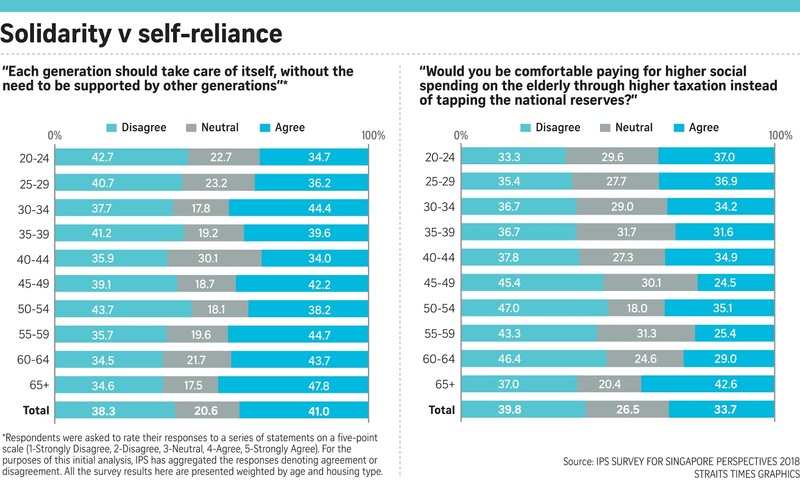 Respondents were also asked if net investment returns should be used to fund spending for the current generation, thus decreasing the amount reserved for future generations. A higher proportion of respondents - 37 per cent - said yes, versus 26 per cent who said no. Currently, half of these returns from investing national reserves can be spent on current needs. The survey also asked respondents to rank four sectors - family, community, employers and the Government - in order of importance when it comes to bearing responsibility for taking care of older people. Family was ranked first by 73 per cent of respondents, with 88 per cent ranking it first or second. Up next was the Government - 22 per cent put it at number one, with 69 per cent saying it was first or second. Another finding: Two-thirds of respondents believe older workers aged 55 and above face age discrimination when looking for work. This belief was consistent across age groups, including among younger respondents. The report said: "This shows younger people are also aware of age discrimination in the employment market, and suggests some sympathy for older workers. Younger workers might also be voicing fears of confronting age discrimination themselves when they are older." If fertility rates in Singapore remain at current levels, the ageing population will cause a drag of 1.5 percentage points on per capita gross domestic product (GDP) growth every year until 2060. Delivering the finding in a study on Thursday (Jan 18), researchers from the Institute of Policy Studies (IPS) estimated there will be 91 elderly citizens for every 100 working-age Singaporeans by 2080 — up 10-fold from 1980. 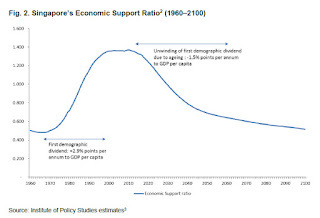 This was based on the assumption that total fertility rate stagnates at 1.3, with 20,000 immigrants adding to the population each year, said IPS senior research fellow Christopher Gee in a 20-page paper titled Harnessing Singapore’s longevity dividends: The Generational Economy, Society and Polity. 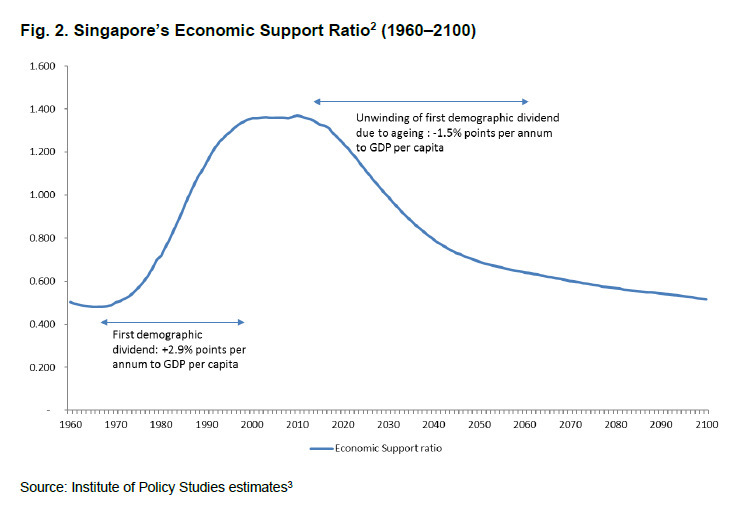 The paper is the second study in consecutive months discussing Singapore’s demographic challenge. Last month, UOB economist Francis Tan highlighted that the number of elderly in Singapore will match that of those younger than 15 this year for the first time in its history – marking what he dubbed the start of the Republic’s “demographic time bomb”. Mr Gee’s study, aided by research associate Yvonne Arivalagan and postdoctoral fellow Chao Fengqing, will be presented at the annual Singapore Perspectives conference on Monday. The multiple challenges posed by an ageing population include lower economic growth and the increase in aged residents exceeding the growth in the labour force. The government will also need to spend more on social needs and may have to raise taxes in tandem, which could hurt economic competitiveness. Despite the challenges, the IPS researchers argue there remain other “longevity dividends” that Singapore can tap, such as its rising health expectancy, education, accumulated savings, and investments in technology. While immigration has traditionally been a major element in the Republic’s population policies, the authorities have recognised that immigration policy has to be well-calibrated, and is only one measure to mitigate the economics of the ageing population, they said. There are limits to the extent that immigration can offset the effects of an ageing population, as “immigrants also grow old”. Health policies should focus on minimising the number of years spent in ill health as lifespans lengthen. The gap between average number of healthy years lived and total life expectancy for males has risen from seven years in 2005 to 8.2 years in 2015. For females, the difference has widened from 9.2 years to 10.1 years over the same period. The researchers’ estimate of the economic effects of Singapore’s ageing population are also predicated on a growth in life expectancy of two years per decade. If human capital investments in education continue, about 87 per cent of Singapore’s working-age population and 85 per cent of seniors will have tertiary education qualifications, representing a “substantial increase” in human capital potential, which can help to uplift productivity and well-being, they noted. But the effects of this educational dividend could be limited by obsolescence or ageist attitudes in the workplace, the researchers warned. There is also a need for more schemes to help people manage social risks that come with longevity, such as catastrophic health shocks, employment shocks and risks of outliving their financial and leasehold housing assets, said the researchers. While some countries rely heavily on taxes and public transfers to fund old-age consumption, Singapore’s “social and political compact” is based on low taxation levels, complemented with “targeted assistance ... for those who need it the most”, the study said. “But relying solely on individual savings to finance old-age consumption may accentuate income and wealth inequalities ... We should be able to do more to pool social risks,” said Mr Gee. Universal long-term care insurance schemes, wage loss insurance and community-based living programmes are some examples of how social risks can be “pooled” and spread out across the community, he added. What can Singapore expect beyond 2060? Mr Gee said the GDP per capita growth projections “could be slightly different but (the trend) will probably be very much the same”, if the assumptions on total fertility rate, immigration and life expectancy hold. The study noted that in Singapore’s first 35 years post-independence, the country was able to tap a “demographic dividend” that arose from a combination of factors, including the post-war baby boom, substantial human capital investments in health and education, then followed by a fertility decline. According to the study, this “first demographic dividend” helped bring up the GDP per capita growth by 2.9 percentage points annually over those formative years.